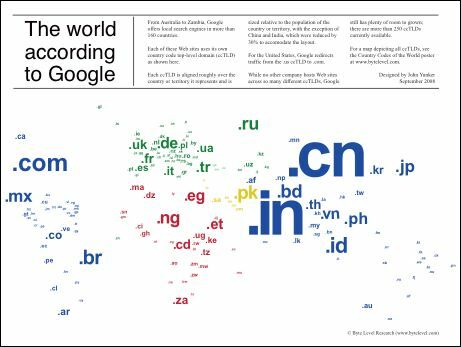 Inspired by our Country Codes of the World map, I developed a smaller version that includes the ccTLDs currently in use by Google for its local search engines. As you can see here, Google has quite a few ccTLDs in use — more than 160, including Andorra, Kenya, Ukraine, and Ghana. Why did I pick Google? Because I know of no other company that hosts localized Web sites across so many different country codes. These may only be search engine interfaces, but they are still significant. While plenty of multinationals have registered hundreds of ccTLDs, few have put them to use so extensively. And Google has room to grow — there are more than 250 ccTLDs available. It’s also worth noting that Google redirects visitors to its .US domain to .COM, which I think is short-sighted. As I’ve written before, .COM is not synonymous with USA. I have a few other companies in mind for this visual treatment. I’ll keep you posted. This map is free and you can download a PDF here.